The Bulldog is one of the most popular dog breeds in the world today and with a good reason. They have sweet tempers and have an air of dignity around them. At the same time, they can become very clownish when they’re puppies and provide lots of laughter for family members young and old with his antics. The bulldog is a result of intensive breeding that has resulted in a very well defined dog who sports a very unique set of physical and temperamental qualities. In the past, Bulldogs were used for the purpose of bull baiting which is a very bloody sport. Today, the Bulldog enjoys a more relaxed lifestyle, lounging around as a family pet. The bulldog is unmistakeable in its appearance. It is a heavily muscular dog with a wrinkled face and a distinctive short, almost pushed in muzzle. Bulldogs also often sport an overbite which gives them a grotesque appearance. 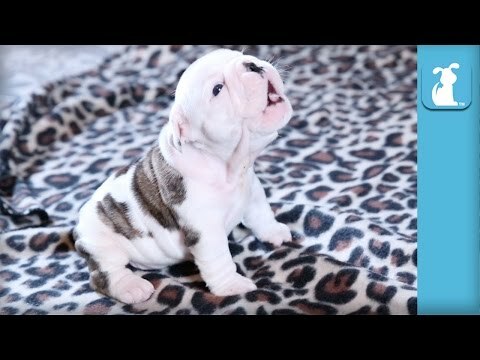 For Bulldog lovers, this quality is very cute and adorable. As puppies they have yet to develop the signature wrinkles but they do look like miniature versions of the adults. Due to strict breeding processes, the bulldog has become a very sweet tempered dog with an air of dignity around it. It is an extremely popular pet due to the fact that it is very well mannered around family members, especially young children and older adults. 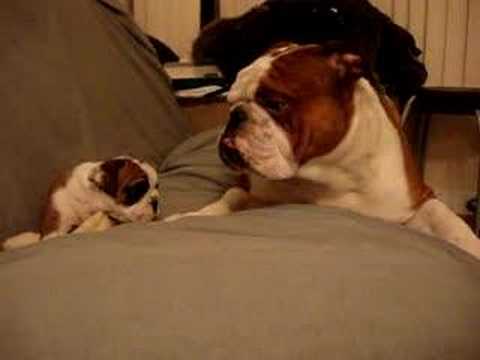 In fact, the Bulldog tends to create very strong bonds with his owners when they start out as puppies. One of the main reasons why the bulldog is distinctive in its appearance is also the reason why it comes with a cavalcade of health issues. Most of the things a bulldog suffers from are genetic in nature. Hip dysplasia is common among Bulldogs so care should be given when your pet is out and about. Another common issue Bulldogs are known for are breathing issues. Due to their extremely shortened muzzles, Bulldogs may find it very hard to breathe. 0 Bulldog puppies for sale near you. 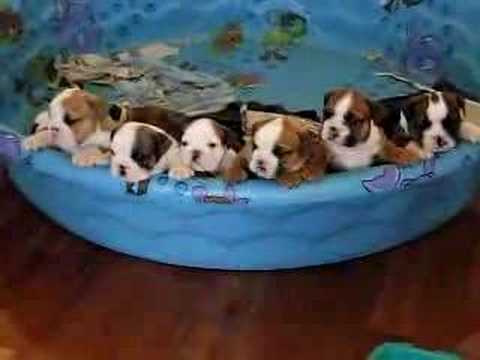 The English bulldog puppies for sale are often thought of when considering the will of the English people during World War II. The dog is very compact, generally short, and extremely strong. The bulldogâ€™s head is massive for such a small dog and it is in the face that his temperament is shown. The folds of skin along each side of his head give an unkempt look to his visage, but that just adds character to an already developed attitude. His nose is broad and his nostrils are large and expressive. When looking at his face, one is struck by the eyes which are set deeply into his head and accentuated by the small ears which are high on his head. Massive, broad, and foreboding jaws with a definite under bite are characteristic of the English bull. The short and very smooth coat will be accentuated by remarkable colorings ranging from red to a solid white and every shade in between. When looking at the dog from the back, you will notice that the tail can be curled or straight and held low. Of all the breeds, these puppies for sale will be an intimidating presence. This is all show because the bull is one of the gentle breeds available to mankind. As with all dogs, there are exceptions to the rule but the English bulldog puppies for sale are an affectionate and gentle animal, good with children, and very persistent. They are a real people dog and do their best to get oneâ€™s attention and will love any interaction they might have with the human pets in the house. The one thing that these puppies for sale will require is a considerable amount of human attention from an owner who is the â€œalphaâ€ leader of the house. When the dog knows who the leader of the pack is one will not have any problems with the bull. These puppies for sale are playful and full of energy and will tend to slow down as they get older. When asleep, these animals snore and do so loudly. Drool is always a problem and they are very messy eaters. One needs to be sure to wash the feeding tray when the dog is done eating. Some bulls can be dog aggressive but this does not happen when the human has established himself as the ruler of the house. The one thing that an owner must never do is let the bulldog take over the house. To insure that the dog is happy, they must recognize the owner as the leader. Good training is something that should be considered when looking at the English bulldog. The English bulldog does have some breathing difficulties and usually poor eyesight. They are sensitive to changes in the weather and can suffer heat stroke in hot weather. These puppies for sale are susceptible to hip and joint problems as well as some skin infections. When establishing their food program, give careful consideration to the fact that flatulence is a problem when the dog eats food from the table or meaty snacks. The average weight for an English bull is between 40-55 pounds. The males tend to be a bit chunkier than the females. One need to remember that these puppies for sale need to be walked daily and to not do so could possibly lead to some behavior problems, The life span for a cared for bull will be about 8-10 years. Grooming problems for these puppies for sale are few. A good soft brush and comb will keep the coat looking good. Shedding is not really a problem, but loose hairs are always something that must be expected. One must wash the dogâ€™s face daily giving attention to the folds of skin in order to keep the dog clean. A bath is not something that must be done on a regular basis. The bulldog is a descendant of the Mastiff and comes to us from the area of England. Tradition has it that these puppies for sale were used in an arena sport called â€œbull baitingâ€ which was outlawed in the early 19th century. The dogs that were used for that particular sport were aggressive and very brave. According to the tales, they would attack the bull from underneath and grab the throat of the bull. This temperament has been bred out of the animals we are able to have, today. The Bulldog puppies for sale are great family dogs, loving to children and a good companion. This is a nice way to make your life easier and save time searching for your Bulldog dog’s puppy for sale. Once your email alert is put in place, all you have to do is check your emails regularly! You can create several email alerts, should you wish to do so.